Chinese Beef Noodle | Get Your Grub On! We didn’t feel like our usual lunch options today and then one colleague suggested ‘Din Tai Fung’, another colleague really liked the idea and I haven’t been there for over a year plus so it became our choice for the day. They were a bit understaffed so it took us some time to get seated even that half the restaurant was empty. 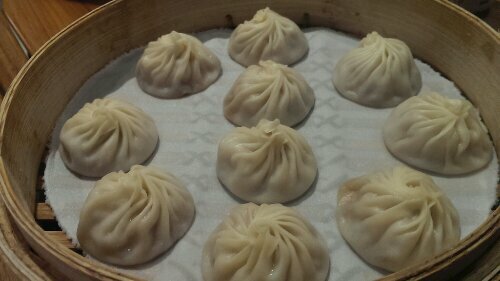 Finally in we started of with the ‘Xiao Long Bao‘ which they are obviously famous for. Their skin was nicely thin but strong enough not to break when picking them out of the basket but the broth and meat seemed a bit watery and bland in taste. I’d still prefer the steamed buns from ‘Crystal Jade‘, ‘Hong Guo‘ or ‘Si Chuan Dou Hua‘. 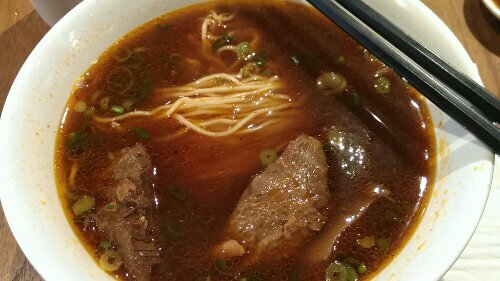 I had upset my stomach with something so I skipped the new ‘Spicy Noodles‘ on the menu and went with the ‘Braised Brisket Beef Noodles‘ instead. It was actually quite nice, the broth was rich and beefy and deep dark in color and tasted a bit like goulash with a hint of tomato. When I slurped the last sips from the bowl I particularly enjoyed the roasted garlic and ginger bits that were like refreshing but more hearty pop rocks. The beef was alright and tender but unfortunately pretty fatty too but the letdown were actually the noodles that tasted okay but were downright overcooked. It’s a chain restaurant so it doesn’t really impress with its’ excess of flair and atmosphere and unfortunately this time I was also rather disappointed with the food. In Germany I would be endlessly happy to have a place like this but here the standards are just on another level. I was on a weekend trip to Hong Kong with three of my friends and as it happens, during our first night we visited a couple of establishments specializing in liquids. This caused us all a rather mediocre feeling the next “morning” but I had the perfect cure lined up for us which I wanted to try since I found out about it. 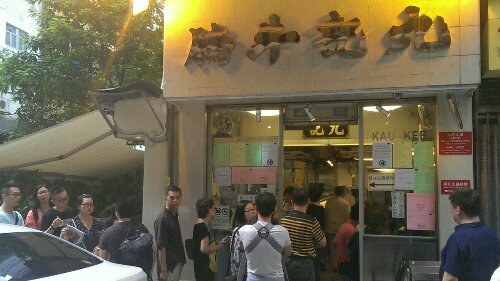 ‘Kau Kee 九記牛腩’ in Central is specialized in ‘Brisket Noodle‘ and always had a fairly long queue waiting in front when I passed by before. Thankfully people don’t take too much time eating at such unpretentious (thanks for the word Andi) places and so it didn’t take us more than twenty minutes to get a table. A friend told me that the portions here were rather small so we ordered two bowls per man. I also tried to order the signature ‘Brisket only in Special Soup‘ for us to share but the waitress practically forbid us to get it because of its’ “lack of authenticity” which later just turned out to be its’ lack of availability. The first bowl I had was their famous ‘Beef Brisket with E-Fu Noodles‘ which was awesome. The noodles were super all dente and gave it all a bit of an extra special taste. The longer they sat in the bowl the more the soaked up the soup but didn’t really lose their bite. The soup was deliciously beefy which completely fitted the purpose for a late morning after an early night and the brisket itself tasted brilliant too, soft and with some not unpleasant fat pockets in between. My favorite. 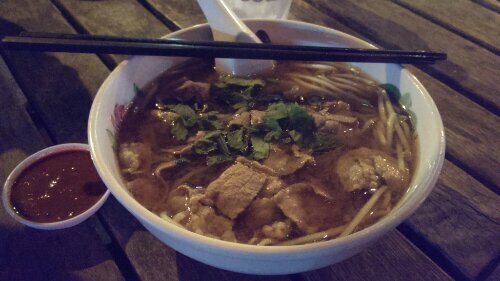 For the second round I ordered ‘Beef Slices with Rice Noodles‘ which was quite different and rather boring compared to the first bowl. Now obviously they used the same tasty broth but it was missing the extra bit from the e-fu noodles and the rice noodles were so soft that I got really jealous of my friend’s mee pok version. The beef itself was fatty, difficult to bite and therefore the size of the slices just made it odd to chew so I left most of it sitting in the bowl eating around it. Nothing special about this place with its’, let’s call it rustic interior and the bossy waitress telling us what to eat, if it wasn’t for the super brisket and e-fu noodles which perfectly brought us back on track and left us content and well prepared for our second night in town. I’ll come back.